Rolf Harris is an Australian-British painter, musician and television personality. He was born on 30 March 1930 in Bassendean, an Australian suburb near Perth. Desirous to become a painter, he gave up his studies in Australia at the age of 22 and moved to England, where he went to the “City and Guilds Arts School” in London. Besides being a brilliant painter, Harris was a great musician. His first song Tie me kangaroo down, Sport was recorded in 1960. In order to imitate the sound of a leaping kangaroo, he used a wobble board as a musical instrument. Harris invented this instrument accidentally, when he dried a fresh painting by shaking a hard-board, thus discovering the peculiar sound it produced. In 1989, Rolf Harris made a remarkable cover version of Led Zeppelin’s song Stairway to Heaven. In the style of his Tie me Kangaroo down, Sport, including his famous wobble board, he performed it for the first time during his appearance on the Australian comedy / talk-show The Money or the Gun. 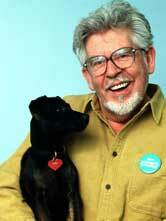 Nevertheless, Rolf Harris is especially known as a TV-figure. He made his debut on BBC television in 1953 and was the presenter of several animal-based and Arts programmes. The most famous animal-based programme he hosted is Animal Hospital, which showed the everyday life of a British veterinary practice. It got rave reviews and was no less than five times awarded Most Popular Factual Entertainment Show at the National TV Awards. Between 2001 and 2007, Rolf Harris recorded 28 episodes of his Arts programme Rolf On Art, focussing on the life and art style of a number of notable artists from history, including the Impressionists (e.g. : Claude Monet), the Post-Impressionist (e.g. : Henri Rousseau) or the 20th Century Masters (e.g. : Salvador Dali, Pablo Picasso). On 1 January 2006, a special episode was broadcast, when the BBC commissioned Rolf Harris to paint a portrait of Queen Elizabeth II, on the occasion of her 80th birthday. After its immense success, Rolf on Art was followed by a new Arts programme, Star Portraits. In it, three artists painted a portrait of a celebrity, who could then pick out one portrait at the end of the episode.